MOVE is inspired by ideas of community hub, human activity, celebration of sport, and inclusivity of people. This sculptural element creates a dynamic gesture of movement both along the linear rhythm of the fins and through the twisting geometry of the entire structure. Each fin has a permanent half-tone image on its surface, created through a process of dye sublimation. These images appear as fragments of people engaged in a variety of activities, but quickly align into full larger than life portraits of people engaged in activity, from all ages, genders, and ethnicities. The artwork is activated by the very movement of those experiencing it. 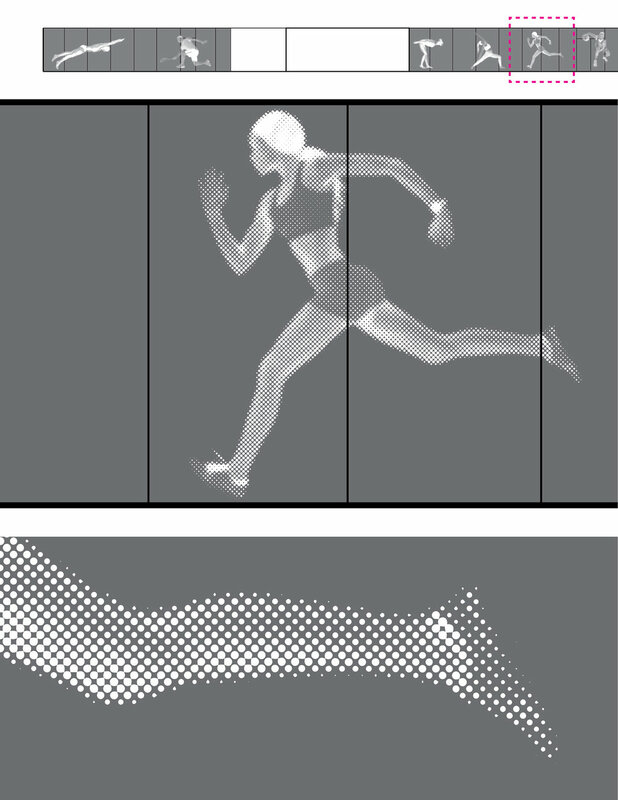 Super-scale halftone images of athletes are applied to the interior glazing partitions of the building as abstract dots that become legible figures with distance.